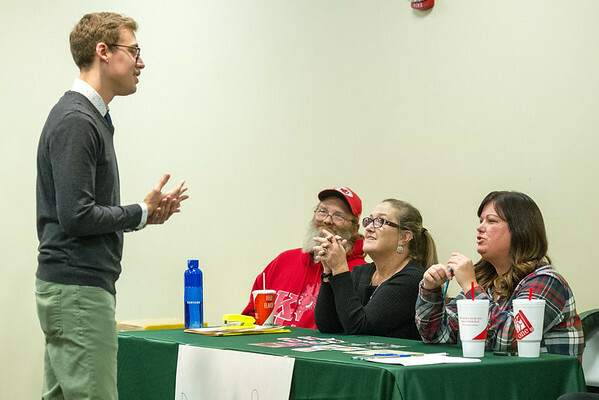 From the left: Garrett Pekarek chats with volunteers Ray LeGrand, Kelly LeGrand and Amanda Slankard at a donation table benefitting Lafayette House during "No More," an informational expo on domestic violence and sexual assualt on Tuesday night at Missouri Southern. The event was organized by Pekarek as part of a service learning program in his homors sociology class. Pekarek said the goal of the event was to start a dialogue on the issues of domestic violence and sexual assault.